Leadership Garden Legacy was founded by Debra Slover in 2006. Debra has a lifelong passion and commitment to empowering unstoppable leaders, with a unique purpose and aim, in everyone. This program has something for everyone including adults, children, schools, communities and even businesses. "You can't plant a garden, walk away, and expect it to flourish on its own - without some kind of human care. The same is true of your Leadership Garden." We had the opportunity to review the Family Empower Tool Kit Bundle from Leadership Garden Legacy. Because of my children's ages we utilized these portions of the program U.N.I.Q.U.E. 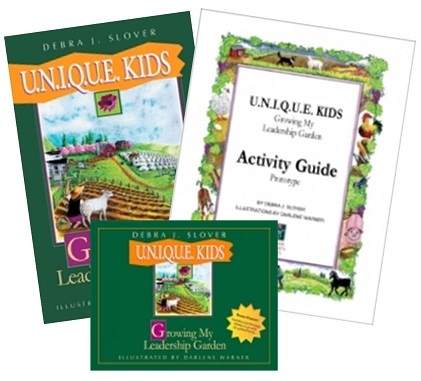 KIDS: Growing My Leadership Garden paperback, MP3 audio downloads and U.N.I.Q.U.E. 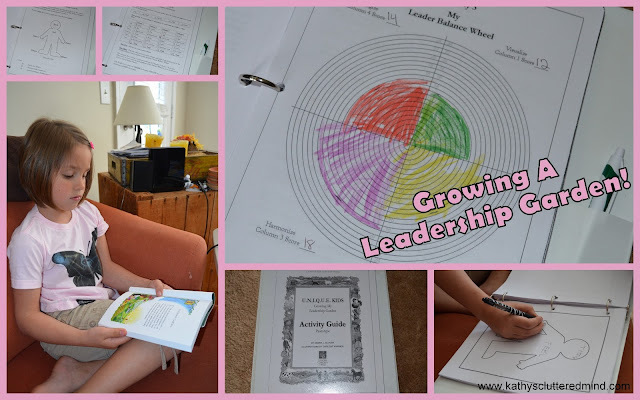 KIDS Activity Guide & My Leadership Garden Journal - PDF Downloads. These resources are designed to be use with children ages 5-12. I used them with my almost 6 year old and 7 year old. Every person is a unique seed in the world’s garden. Each seed grows a leader from which greatness can blossom. Imagine the future of our planet if we nurture each child to sprout greatness. One of my goals as a homeschool parent is to raise my children to have good character qualities as well as become strong leaders. When I signed up for this review I mostly had my 7 year old daughter in mind. She already has some great goals for her life (even at the age of 7) and she has some great leadership qualities. But I want to help her in anyway I can with building them. Leadership skills are important for all individuals and will help anyone throughout their life with relationships, jobs and roles. Gwyn is compassionate, kind and a great team player. However she struggles with making good choices, low self esteem, responsibility and being over critical of herself. Her feelings also get hurt very easily. The paperback book is 125 pages and has great colorful illustrations. It is an engaging book and my kids often asked if they could listen to one more chapter! It can be used as an independent reader for older children, a read aloud for younger children or used in conjunction with the MP3. The book is broken down into two parts and contains 8 chapters total. And because it doesn't make any religious references it can be utilized by both Christian and secular families. Throughout this fable Hugh (one of the main characters) takes a journey through the "Leadership Garden". The "Leadership Garden" is a great metaphor for explaining to children how to plant and nurture seeds of good leadership while ridding their gardens of the "weeds." In the first couple of chapters children learn the three kinds of seeds that grow in Leadership Gardens: how you think, how you feel and how you behave. Hugh is a lost and wandering sheep with some good seeds and bad weeds (negative qualities that can harm children's self-worth). Hugh represents the human heart, mind and spirit. While on his journey Hugh learns how to become a courageous leader with unique purpose and aim. Along with the farmer and some other animals Hugh guides children through the Leadership Garden. Starting in part two of the book each chapter will discuss the U.N.I.Q.U.E. acronym, one letter per chapter. Children will be guided on a journey to learn about creating their own garden by harnessing the six U.N.I.Q.U.E. qualities. Children will learn about respect, responsibility, cooperation, trust, team work and more. Throughout the book many acronyms, leadership terms and character words are discussed. At the end of each chapter there are great discussion questions. I love that there are MP3's that follow along with the Leadership Garden book (there is a cue when it's time to turn the page). This made it very easy for me to have Gwyn sit at the computer with the book and follow along (while I was making lunch). After listening to a chapter on the MP3 I would mark the ending time on our bookmark so I could easily start us where we left off. After she was done with a chapter we would discuss the end of chapter questions and complete the activity guide and journal together. My first impression was that she was not ready for this program. Gwyn's first reaction was, "mommy is this a book about how to behave?" But both kids loved the story so we kept chugging along...I just figured I would just tailor it as needed. We utilized the Leadership Garden materials 1-2 times a week. We are not quite finished with the book because we did have to go over a couple of the chapters more than once to further discuss them. This is definitely a resource we will continue to use as the children grow and begin flourishing into preteens, teens and young adults. As I mentioned I wasn't sure my daughter was old enough for this program. But after 3 chapters I changed my mind. We came to a part in the book where children learn about 4 leader behaviors that help fertilize their seed of courage: visualize, organize, harmonize and energize. In chapter 3 Hugh learns about his "Leader Balance Wheel" which helps him visualize where his strengths and weaknesses are. Imagine my surprise when Gwyn explained to me the leader behaviors that she uses most and the ones she would like to cultivate and grow. We then moved onto the Leader Balance inventory sheet and balance wheel. There were a few things that I had to explain further in a way she would understand but overall she was able to get through the exercise. And guess what? Her results were dead on. She had actually observed her strengths and weaknesses before doing the balance wheel. And the balance wheel provided a great visual for her to understand her strengths and weaknesses better. So now I firmly believe a 7 year old can utilize this program. I loved that there were additional resources (beyond the end of chapter questions) to go along with the book. This really helped to reinforce what she was learning as well as help her grow her leadership skills and put what she has learning into action. There is a journal as well as activity guide that can be utilized along with the U.N.I.Q.U.E. KIDS: Growing My Leadership Garden book. We have been trying all the various exercises and activities. Almost all of them Gwyn has been able to do but I have had to reword or explain in more detail some of the terms. The activity guide is full of great activities to help reinforce what your children are learning. There are several worksheets that go along with each chapter. On the first worksheet there is a corresponding lesson summary from Hugh, the lesson visual box and "Hugh Wants To Know" discussion questions (the same ones from book). Next are the sample activities (some of these activities are also in the journal as well). The last worksheet for each chapter is the Oregon Standards Description and Character Education goals for 3rd - 5th grade. These can easily be aligned with your state standards if need be (at the end of the guide these standards are explained further). And at the end there is a culmination activity. The journal is full of great activities (also included in activity guide) as well as journaling pages. We didn't use this as much as we utilized the activity guide because my daughter is not really writing all that much on her own yet. But this would be a great resource for older children. The key thing with the Leadership Garden is talking with your children and getting them to learn and recognize all the different leadership qualities and then apply them. And the book has done just that. After 3 chapters my daughter started pointing out her seeds and weeds throughout the day. She would even make a pulling motion above her head when she needed to pull out a bad weed. I am not a very good gardener. I kill everything I try to grow including cacti and air ferns. But with the help of Leadership Garden Legacy I was able to help my children grow their "Leadership Gardens." I liked the story a lot. I have learned how to behave better and how to grow a leadership garden. I pick bad weeds out of my head. The U.N.I.Q.U.E Kids book costs $18.95, the PDF download of the activity guide costs $8.95 and the MP2 audio download is $8.95. There are also BUNDLE kits available where you can save The Family Empowerment Tool Kit is what we received, this includes all the kid resources as well as the adult resources. This bundle is $76.25 w/FREE shipping (15% off savings). But wait there's more. Leadership Garden Legacy is offering the TOS Community a "Spring Special Discount" of 20% off all their empowerment tools...including their already discounted bundles. Use the discount code TOS-SS20D at checkout. This code expires May 21, 2013. Click here for more Leadership Garden reviews from the The Schoolhouse Review Crew.